Roper Lake is stocked with Largemouth bass and Rainbow trout; it's a great place for kids to catch their first fish. Boats are limited to small electric motors, creating ideal conditions for a sail board or a canoe. Enjoy five miles of trails in the park and nearby Dankworth Pond. Take advantage of excellent birdwatching and glimpse Gamble's quail and heron. The park's camping cabins offer an easy, fun camping experience. 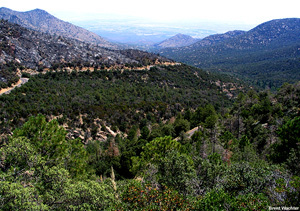 Mount Graham is the highest mountain in the Pinale�o Mountains. As the name "Mount Graham" is often used by locals to refer to the entire mountain range, the peak itself is frequently referred to as "High Peak". The mountain reaches 10,720 feet (3,267 m) in height, attaining the highest elevation in Graham County. 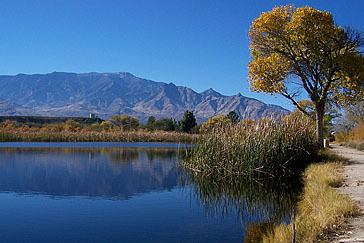 It is twentieth of the 57 ultra prominent peaks of the lower 48 states, and the first of the five in Arizona.